← Never a dull moment in Shuddh Desi Romance! Half Ticket: Kishore Kumar’s return ticket to childhood! Often one longs for those carefree days of childhood when throwing a tantrum didn’t cause ill will and getting away with mischief was an assumed privilege. 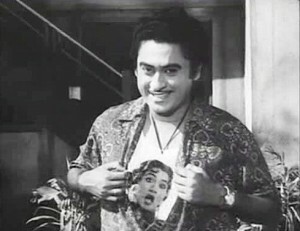 The inimitable Kishore Kumar takes this unique opportunity to wind back in time and play one such impish darling in the black and white comedy, Half Ticket. Most films of the genre rely on wit, timing and spontaneity to make the humour work. But in this 1962 release, produced and directed by Kalidas, Kishore Kumar is the source of ALL hilarity. The brisk narrative, which doesn’t possess a single serious bone in its body is partially inspired by Sidney Sheldon’s screenplay of You’re Never Too Young (1955). The Jerry Lewis starrer itself is based on Fannie Kilbourne’s story (previously converted into a play by Edwards Child Carpenter and a Billy Wilder film, The Major and the Minor (1942) featuring Ginger Rogers). Like You’re Never Too Young, a young man disguises himself as a kid to secure a concessional train ticket since he’s short of money, finds himself chased by a crook who’s sneaked a diamond in his hip pocket and on-the-run bumps into a sweet, sympathetic lady in the compartment. Unlike You’re Never Too Young where Jerry Lewis is a humble hairdresser’s apprentice who ends up in a private girl’s school, Kishore Kumar is the socialist son of a capitalist father (owner of two mills and four factories) who is kicked out of home for his rebellious, prankster ways and lands in Mumbai (then Bombay) in search of a job. Half Ticket takes obvious inspiration from the Lewis caper up to the train journey sequence but even then the incentive, muddle-ups and humour is entirely its own invention. 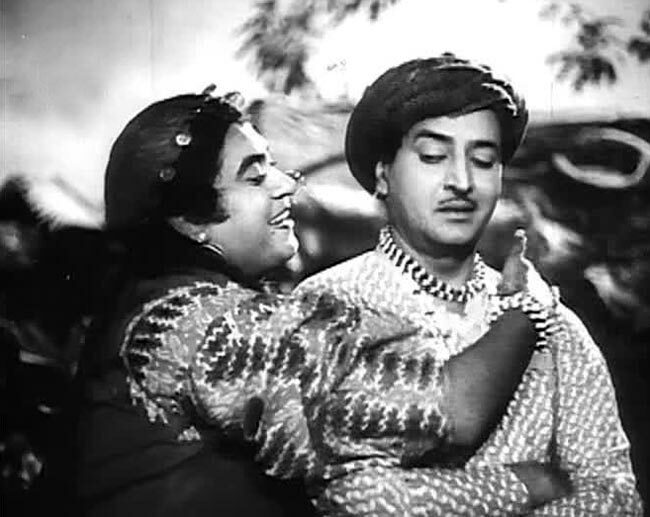 Throughout its hilarious setpieces, the quick-witted Kishore Kumar is pursued by Pran and protected by Madhubala while he dives from one setting to another, changing costumes and professions, yodelling his way in and out of trouble. This is completely his show from start to finish. Whether he’s Vijay, the anti-establishment son of an industrialist giving out speeches outside his college ‘Chattriyan lekar juloos nikalenge’ for his impoverished classmate or masquerading as gardener and fabricating lies about himself to put off matchmakers or locking up an army of domestic help at home to mortify his father’s esteemed guests with his brand of *hospitality*. The afore-mentioned description, ladies and gentlemen, is barely 15 minutes of the film. Needless to say one can expect non-stop entertainment in Kishore Kumar’s breathless buffoonery in the 120 minutes to follow. The best part, of course, is when Vijay bids adieu to his grumpy dad (Moni Chaterjee) and photoframed mom (Kishore Kumar again) with only a shaving kit in the name of luggage (most logical considering the events to follow) and heads for Jabalpur railway station. Here Tuntun, delightful even in a two-minute role, and her equally tubby son attract Vijay’s attention. He tempts the boy with lollipops (Lewis uses a space gun) and slyly changes into his clothes and transforms into a picture of supreme cuteness. It all sounds plain wrong on paper but the harmless roguery in Kishore da’s body language renders it both perky and innocent. While he haggles with the unwilling railway clerk to buy a half ticket, Pran, a notorious diamond smuggler from Africa, slips a diamond in his hip pocket. And THAT is the beginning of ensuing chaos and chase. Unable to fathom why a nattily dressed adult is constantly feeling up his rear, Vijay flees compartment to compartment, pausing to gladden his co-passengers (and us), with composer Salil Chaudhary and lyricist Shailendra’s evergreen, effervescent classic, Cheel cheel chillake. After a rather Marx Brothers-reminiscent hide and seek, Vijay in his droll schoolboy getup – shirt, shorts, suspenders, skull cap, scarf, specs, schoolbag, socks and shoes and a small teddy bear takes shelter in an unescorted Rajni’s (Madhubala) reserved bogie. His adorable lisping and childlike manners as the ‘maloom-nahin’ spewing ‘Munna melts the gorgeous lady’s reserve within seconds following the disclaimer: Main paagal nahi hoon. 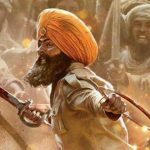 Mera dimaag kharaab hai. Despite the projected oddball equation, the duo shares a palpably fond chemistry. 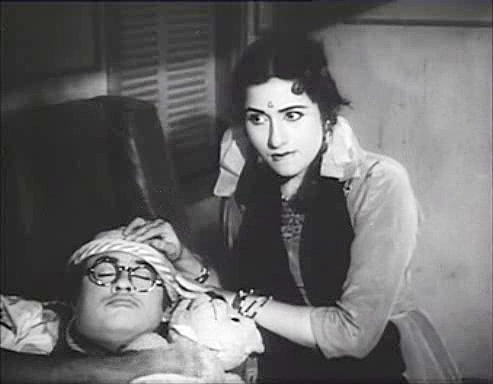 Madhubala alternates between exuding motherly warmth towards the bashful manchild and scolding him for being a scaredy cat. Known to sparkle the screen with their antithetical personalities in films like Chalti Ka Naam Gaadi and Jhumroo, Half Ticket marks the real life couple’s last film together. Though it surprisingly didn’t achieve the kind of recognition Chalti Ka Naam did, Half Ticket’s popularity has increased twofold over the years. It sure ranks among my favourite comedies of all time. Their camaraderie shifts tracks from kindness to banter when the full truth behind Munna’s half ticket is revealed. ‘Ab toh mein bada bacha ho gaya hoon aur pehle se kahin zyada paagal ho gaya hoon,’ Munna, now Vijay again, characteristically argues. His quirks and her fuss arrive at its inevitable realisation (celebrated in melodious love duets like Aankhon mein tum, Chand raat tum ho saath) after a few comical suicide attempts and some prodding from Rajni’s spinster aunt, Manorama (the actress known for her vampy ways in Seeta Aur Geeta is a scream as the Elvis-humming, self-volunteered cupid pining for her erstwhile Chunnu). 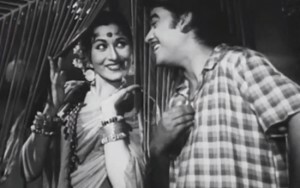 They even film a romantic love song together in the uproarious dance track, Aake seedhi lage with Kishore da dressed as a demure dame and Pran, his serenading suitor. Given its wafer-thin storyline, the running gag throughout is catch me if you can and to the actors credit it never gets old. The eager jewel thief inexplicably figures out Munna’s whereabouts (be it a mela, music store or mansion) setting the scene for rib-tickling comedy. I can’t possible write about all those countless moments. But it’s pretty much the reason why Half Ticket, no matter how many viewings, never feels worn out. ‘Wohmerepeechehaathdhokepadahaibachalemujhebachalemujhe,’ he pleads without a pause to a dumbstruck Helen at the beginning of her ballet, Woh ek nigaah pyaar ki (accentuated by Lata Mangeshkar and Kishore Da’s distinctly operatic vocal efforts.) And sure as expected she lets him perform along side wearing one of the troupe’s Russian folk dancer costumes. The ubiquitous Pran gatecrashes here too lending the merriment additional laughter. Not to forget that impromptu jig between Kishore Kumar and Shammi with the latter trying to dig into her co-dancer’s baggy rear pocket for the sought after diamond and the giggle-worthy sights that follow. Ditto for its thrilling climax, which could easily give a Bond flick a complex what with its action shifting from a crane suspension to giant air balloon to a crashing jet plane to a coconut tree landing. But the comic bombardment is much too fun to question Half Ticket’s utter disregard to take deep breath or relax. You can find Half Ticket’s echoes and reference in so many movies. Whether it’s Amitabh Bachchan’s Mausi-scene in Sholay or the way he goes about demolishing an entire conference in Namak Halal or Govinda’s Munna-inspired Sunder in Jaan Se Pyaara or Cheel cheel dance in Partner, they all contain a trace of Kishore Kumar’s antics from this 1962 comedy. 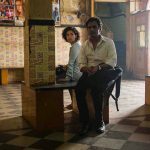 For all its wackiness, Half Ticket wouldn’t be half as effective if not for Kishore da’s spirited, untiring impulses and repartee. He aces both –as a man employing humour as his shield to protest against the social structure as well as the happy-go-lucky lad recreating his childhood to an endearing effect. 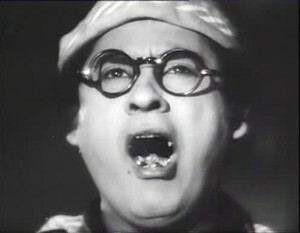 His efforts behind the camera are no less remarkable whether emulating an opera singer in Woh ek nigaah with Lata Mangeshkar, chanting wah wah wahs in Cheel cheel chillake, going full bass with Geeta Dutt on Aankhon mein tum or playback singing for both the girl and boy in Aake seedhi lage embellished with his signature haiii gujariyaaas. Fabulous soundtrack, frolicking premise and frothy dialogues led by the King of Comedy and Queen of vivacity, there is nothing half-hearted about this one. 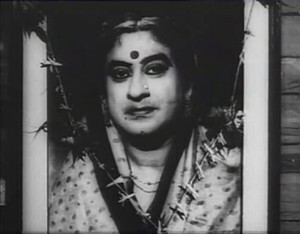 This entry was posted in Classics, Columns & Reviews and tagged black and white, classics, comedy, half ticket, kalidas, Kishore Kumar, madhubala, manorama, pran, salil choudhary, shailendra, shammi, tuntun, you're never too young. Bookmark the permalink. One Response to Half Ticket: Kishore Kumar’s return ticket to childhood! Beautiful review by my child who has reviewed a movie that came when I was a child.